A pig is any of the animals in the genus Sus, within the Suidae family of even-toed ungulates. Pigs include the domestic pig and its ancestor, the common Eurasian wild boar. The young ones are called piglets. Pigs are social and considered to be intelligent animals, though they do not find good references in folklore. During matches, Chepauk turns a virtual fortress … spectators are body-frisked and there are so many items which are not allowed – and that includes whistles, banners, sticks, water bottles, cigarettes and more. In olden days, they used to check only cool drink bottles [of colas] checking whether they are mixed with alcohol… for IPL matches, even a water bottle is not allowed ~ one has to buy things at extraordinary rates…. Long ago, fans would run on to the ground to greet their stars when they hit a century – now you have high fences and watchguards… some of the stands are protected with net too… !! ~ the post is about a strange thing smuggled into the cricket ground !!!!!! In the recent Ashes, England were thrashed. Greame Swann took his 250th test wicket, next only to legendary Derek Underwood but could not relish the success much – and retired during the Series. At Brisbane, England subsided to a crushing 381-run defeat inside four days after a lower-order collapse as spectacular as the storm that preceded it. The Australian Press hailed the victory praising its brutal attack. There were frayed tempers on and off the field - ‘Courier Mail’ refused to print the name of Stuart Broad who took 6 wickets in the 1st innings – citing the instance of his refusal to walk in the 1st test at Trent Bridge in Aug this year. The crowd at Brisbane also booed Broad and there were banners criticizing him….all from Aussies who never believed in walking ~ save Adam Gilchrist. ~ that was not all…..
A spectator smuggled a pig into the first day of the Ashes cricket Test between Australia and England; now is in news that has been charged with animal cruelty. Security guards spotted the pig wrapped in a towel and being carried in a baby harness !! A 33-year-old Australian man was arrested and charged and made to appear in the Brisbane Magistrates Court. More than the carriage, it appears to be all about cruelty to the animal as according to spokesperson of Brisbane chapter of the Royal Society the pig was "really stressed out and dehydrated." The Australian newspapers are agog with news that the fan who smuggled the pig into Brisbane has agreed to undergo mediation with the Royal Society for the Protection of Cruelty to Animals. David Gunn, 33, was charged with animal cruelty after the pig was sneaked into the Gabba ground with its snout taped shut and disguised as a baby. Gunn was found holding the 10-12 -kilogram (26-pound) domestic brown dwarf pig, named Ash, in a baby harness on the first day of the first Ashes test 2013. 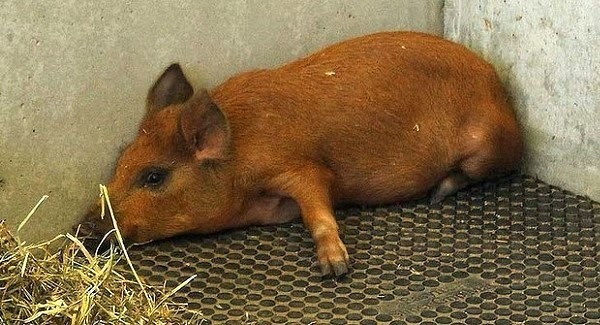 Police did not oppose the decision of the Brisbane Magistrates Court to send the case to mediation, as CCTV footage showed Gunn was not in possession of the pig when he entered the ground. Ash was distressed and dehydrated when examined by a veterinarian following the ordeal. He has since made a full recovery and is leading a pleasant life on a large property in Brisbane, RSPCA spokesman Michael Beatty said. "If we were asked to participate in mediation I'd probably get one of our vets to come along and explain to the person just what stress and suffering their stupidity caused," Beatty said. The incident was a reprise of the 1982-83 Ashes Test at the Gabba where a group of vets brought in an anaesthetised pig that had "Beefy", for Ian Botham, written on one side and "Eddie", for Hemmings, on the other and let it on to the pitch. Mediation, as used in law, is a form of alternative dispute resolution (ADR), a way of resolving disputes between two or more parties with concrete effects. In Australia the concept of "mediation" is understood to be a process in which an independent and impartial person assists two or more people who are in dispute to reach a voluntary, negotiated settlement of their dispute. The mediator acts as a neutral third party and facilitates rather than directs the process.